Nothing much has been said or written about the new boss at the country’s second largest carmaker save for the fact that he was a middle-ranking manager at Iran Khodro, the country’s largest auto company and archrival of SAIPA. 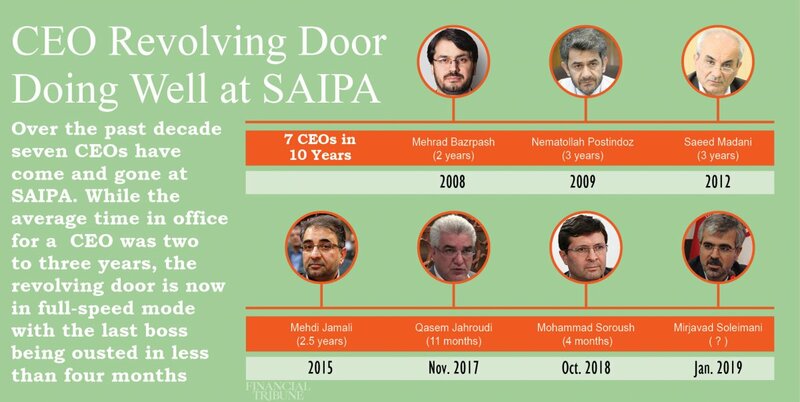 The state-owned auto company, SAIPA, or officials at the Industries Ministry have not said a word why Soroush was shown the door and on what premise Soleimani was got the visibly sensitive job. Last October Soroush had replaced Qasem Jahroudi who was in the post for a year, according to Financial Tribune. Jahroudi himself, who was at SAIPA’s helm for 11 months, had replaced Mehdi Jamali who held the office for two and a half years from May 2015. The average time in office for SAIPA bosses was between two to three years before Jahroudi arrived. Jamali was in office for 2.5 years between 2015 and 2017, while Saeed Madani led the company for three years between 2012 and 2015. Before Madani, Nematollah Postindoz was SAIPA director for three years between 2009 and 2012. His predecessor Mehrdad Bazrpash ruled for two years between 2008 and 2009. While SAIPA’s top managers have been in and out at terrible speed over the past decade, the company’s controversial approach and actions have remained unchanged. Suffice it to say that the company has been producing the small city car Pride for three decades. The car has two major features: low quality and high price! This model was originally developed for Japanese and South Korean markets in the late 1980s. it was widely sold in the United States as a Ford Festiva in the early 1990s and entered the Iranian market in 1993 under license from Kia and continues to be a cash cow for SAIPA. The Iranian company says it has sold over seven million Pride cars since production started in 1993. The South Korean firm ended production of this car in 2000. SAIPA has often been criticized by market observers, the public and environmentalists for its incompetent and irresponsible approach towards the key industry and the environment. The company is infamous for production of low-quality vehicles that flaunt safety rules and are slammed for fuel inefficiency and high emission rates by official bodies and NGOs. In recent months the company has reported a significant drop in output possibly due to the new US sanctions and the difficulty in importing key parts. The new CEO will certainly face an uphill task. During the nine months ending in December of last year, SAIPA produced 328,355 cars and commercial vehicles -- a 30% decline compared to the 471,405 units it made during the corresponding period in the previous year. In the Iranian month ending Dec. 21, it reported 75.9% fall in output with 15,572 cars and commercial vehicles. Daily production of the second largest carmaker has plunged from 2,156 to barely 519. During the nine-month period, Iran’s auto production plunged to 763,519 cars and commercial vehicles -- a 31% year-on-year decline. According to the Ministry of Industries, during the nine-month period, 713,233 cars were produced, down 31.2% compared to 1,037,374 made during the same period last year. The ministry data show 50,101 trucks, buses, and pickups were made in that period, indicating a 27.4% YoY decline. While most companies are quick to point the finger of blame towards the new US sanctions and President Donald Trump’s unending animosity towards Tehran, independent observers say mismanagement at SAIPA and its archrival IKCO has had a major negative impact on the industry.